Objective The outcome of female patients after adult cardiac surgery has been reported to be less favourable compared with the outcome of male patients. This study compares men with women with respect to patient and procedural characteristics and early mortality in a contemporary national cohort of patients who underwent aortic valve (AV) and combined aortic valve/coronary (CABG/AV) surgery. 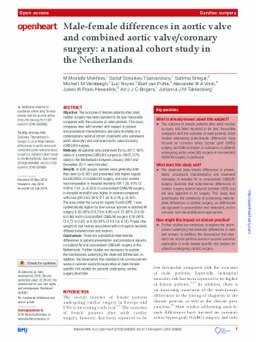 Methods All patients who underwent AV (n=8717, 56% male) or a combined CABG/AV surgery (n=5867, 67% male) in the Netherlands between January 2007 and December 2011 were included. Results In both groups, women were generally older than men (p<0.001) and presented with higher logistic EuroSCORES. In isolated AV surgery, men and women had comparable in-hospital mortality (OR 1.20, 95% CI 0.90 to 1.61; p=0.220). In concomitant CABG/AV surgery, in-hospital mortality was higher in women compared with men (OR 2.00, 95% CI 1.44 to 2.79; p<0.001). The area under the curve for logistic EuroSCORE 1 was systematically higher for men versus women in isolated AV surgery 0.82 (95% CI 0.78 to 0.86) vs 0.75 (95% CI 0.69 to 0.80) and in concomitant CABG/AV surgery 0.78 (95% CI 0.73 to 0.82) vs 0.69 (95% CI 0.63 to 0.74). Finally, (the weight of) risk factors associated with in-hospital mortality differed between men and women. Conclusions There are substantial male-female differences in patient presentation and procedural aspects in isolated AV and concomitant CABG/AV surgery in the Netherlands. Further studies are necessary to explore the mechanisms underlying the observed differences. In addition, the observation that standard risk scores perform worse in women warrants exploration of male-female specific risk models for patients undergoing cardiac surgery.